the prime minister recently approved an organizational structure of government agencies to manage the climate agenda of the country at the national and international level. A three-tier structure comprising a core team, a technical group and a guidance group has been formed (see flowchart). Of immediate importance to the teams are negotiations to finalize an agreement for post 2012the year the first phase of the Kyoto Protocol expires. The special envoy to the prime minister will be the convener of the 12-member core team. The technical group will support the core team in policy and technical matters and the guidance group, headed by the prime minister, will guide the core team at all international negotiations. Besides these agencies, the structure will comprise units to coordinate the preparation and implementation of the National Action Plan on Climate Change.The plan, supposed to spell out Indias response to climate change within the country, was to be released before the Climate Conference of Parties meet in Bali in December 2007. But an initial draft was criticized because it had the steps the country had taken in the past but did not come with a future plan. The plan is expected to be ready by June 2008. It will be finalized by a coordination unit chaired by the Union Minister of Science and Technology. Implementation will be coordinated by the Union Ministry of Environment and Forests. The research agenda under the plan will be coordinated by the Department of Science and Technology and guided by the principal scientific advisor to the government. 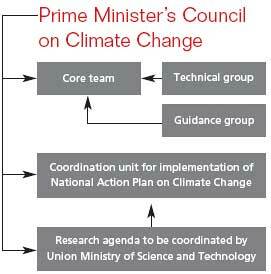 Overseeing both will be the responsibility of the Prime Ministers Council on Climate Change.